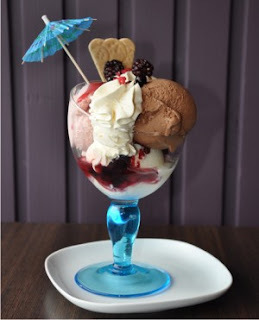 We will offer all our Spurreli Ice Cream Sundaes with 50% off for the duration of the week. Go to the bottom of the page to claim this offer! Spurreli opened within The Old Chandlery in August 2010, next to the boatyard and in between the harbour and town-square. Aswell as Spurreli icecream, our Baristas will serve freshly ground Illy coffee, Ruby Rose patisserie, speciality teas, chilled soft drinks and winter soup. In 2011, we entered the Great Taste Awards - the fine food Oscars, for the first time. Our products to date have won 6 gold stars. With the highlight being voted Golden Fork winner for the Best specilaity food from the North of England for our Sicilian Pisttacchio icecream. Come down to the lounge and read a paper, check your emails on our free wi-fi whilst listening to chilled out music. Pick the intimate banquette for more romantic icecream moments, or maybe grab a high-level stool with your friends by the window and watch the world go by. The lounge lets you enjoy icecream the way you want to. When the weather permits we offer a pavement café, for those that enjoy the outdoor café culture, we find Labradors love vanilla!